CHICAGO (WLS) -- Vernal equinox marks the official beginning of spring at 5:45 p.m. Friday. The equinox occurs twice a year, when the sun is directly over the Earth's equator and day and night are the same length. The Chicago area will welcome the new season with warm temperatures and sunny skies on Friday, once the clouds clear out. ABC7 Meteorologist Tracy Butler said highs will be to be in the mid to upper 50s on Friday. But temperatures are expected to begin to fall Saturday afternoon after highs near 50. Sunday's high temperatures will be in the 30s. Flurries are expected to begin in the middle of the morning commute on Monday. Butler said light accumulation of slushy snow is possible during the day on Monday. The cooler weather will continue next week. But Butler said there is a silver lining to all of this, especially for allergy sufferers. The cold temperatures seem to be keeping the tree pollen and mold counts low. A total solar eclipse was seen by people across Africa, northern Asia and most of Europe Friday morning. Some sky-gazers got a spectacular show while others weren't so lucky on Friday, as the moon completely blocked out the sun in a total eclipse only visible from land in two remote places. There were shouts and cheers in the Arctic where there was a perfect view in a clear sky as the moon's shadow was cast over Norway's remote archipelago of Svalbard. A blanket of clouds in the Faeroe Islands in the North Atlantic blocked thousands of people from experiencing the full effect of the total eclipse. About 20,000 visitors had traveled to the two remote island groups to watch the spectacle. Despite the clouds in the Faeroes, tourists and residents hooted and applauded as the daylight dimmed. A woman in the northern part of the Faeroes said birds there went silent and dogs started howling. The next total eclipse will be over Indonesia in March 2016. There will also be a supermoon on Friday. That happens when the moon's orbit brings it closest to earth. But the moon is in the "new" phase, so it won't be visible. 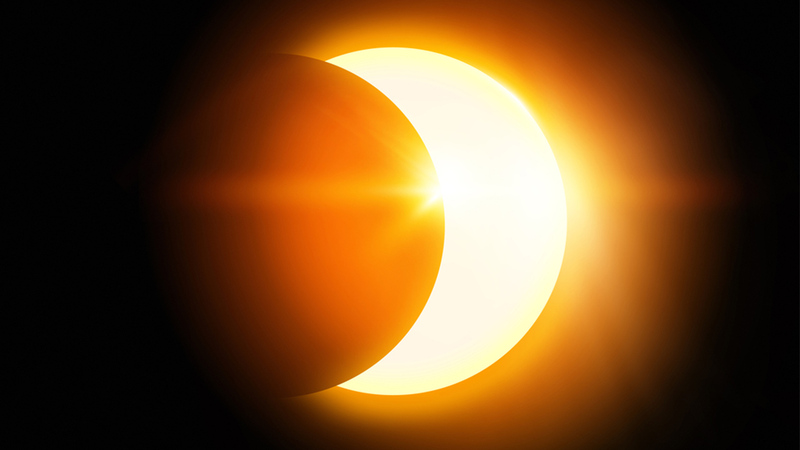 ALL ON FRIDAY: Solar Eclipse, Spring Equinox, and Supermoon!